Plough Quarterly No. 9 : All Things in Common? With the concept of socialism back in mainstream conversations and increasing numbers of Christians unhappy with "Sunday Christianity," it's time to give the lifestyle of Jesus' first followers another look. 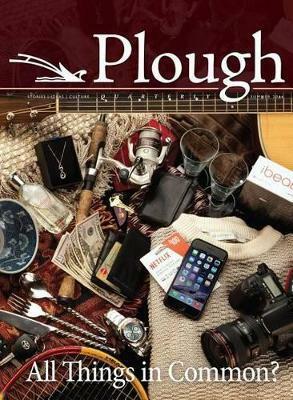 This issue of Plough Quarterly does just that, profiling intentional Christian communities past and present and gleaning wisdom on the daily practicalities and pitfalls of communal living from those with years of experience in following Jesus together. Hear from Stanley Hauerwas, Rick Warren, Leonardo Boff, Chiara Lubich, C. S. Lewis, Jean Vanier, Henri J. M. Nouwen, Eberhard Arnold, and D. L. Mayfield. Then there's new poetry, book reviews, a children's story by Kwon Jong-saeng, and world-class art by Salvador Dali, Wassily Kandinsky, Juan Rizi, Marianne Stokes, Francisco de Zurbaran, Dong-Sung Kim, Christian Schussele, Gustave Caillebotte. Plough Quarterly features stories, ideas, and culture for people eager to put their faith into action. Each issue brings you in-depth articles, interviews, poetry, book reviews, and art to help you put Jesus' message into practice and find common cause with others.